Make it Personal: Add a monogram, name, date or personal message to make a gift truly special! Mariposa products are all handmade. No two pieces are ever exactly alike. Fine metal is handcrafted from 100% recycled aluminum and will not tarnish. Free Engraving at The Butter Paddle on September 19! Sullivans clear glass bottles lend a certain charm to decor. Simple and straightforward, this glassware will serve as the perfect vessel or decorator piece for your tabletop, shelf, or mantle. Cleverly wrapped in wire with a wicker ring along the top and the base, this is not your ordinary bottle, but a focal point for the room. Or, you're in luck with this collection of glass bottle vases. Connected by hinged metal holders that are attached as a chain, but free to move about, each bottle is removable. The ultimate in style and warmth, this scarf echoes the luxury of cashmere. Super soft, thick and generously-sized, it features soft blush pink and metallic gold stripes on creamy white. Tassels at the end create the final, perfect detailing. Gorgeous! Can be worn as a scarf or used as a blanket to keep warm in cold offices or at home. See the other colorways available at The Butter Paddle. Clara Beau is a jewelry company based in the SF Bay area. They take inspiration from Vintage collections to create modern accessories with a classic feel. The Butter Paddle has a wide variety of Clara Beau earrings embellished with Swarovski crystal. 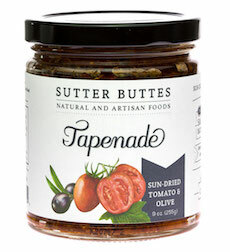 Sutter Buttes Sun-Dried Tomato & Olive Tapenade is simply divine. The tomatoes are slow-dried in the sun and blended with just the right amount of herbs. Addition of crushed Kalamata Olives create an intensely deep flavored tapenade. Use as a pesto and stir into warm pasta. Spread on sandwiches, pita bread, or toasted crusty breads. Use to season fish or chicken before grilling or baking. Use as a topping for pizza or focaccia. Mix with ricotta or cream cheese to create a delicious dip. 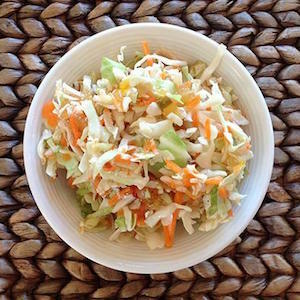 Whip up this quick and easy slaw for pork sandwiches and cook outs. Its also a great topping for gourmet hot dogs!